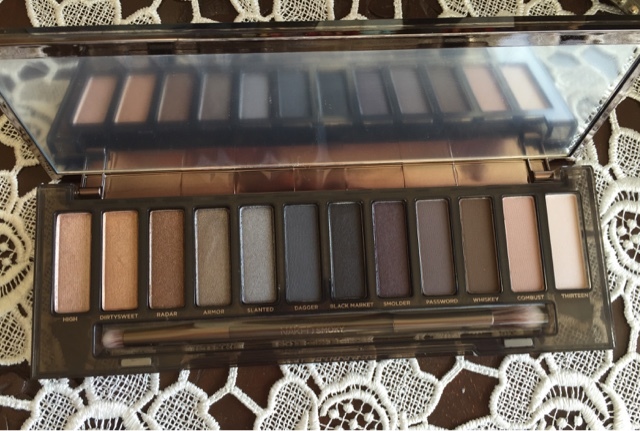 I wanted to do this week's review with a review on the Urban Decay Naked Smoky Palette. I happily received this beautiful palette as a present from a dear friend, and I'm already in love with it. I've used it for daily purposes and for nights out. One disclaimer I will make right off the bat - is that it's not for everyone, and I'll get more into that later, after the review. They even give you a little instructional pamphlet that teaches a couple of UD put together looks. They don't often do this, and since the smokey eye is still a technique that most women haven't mastered (including myself! ), it's great to have a reference handy. 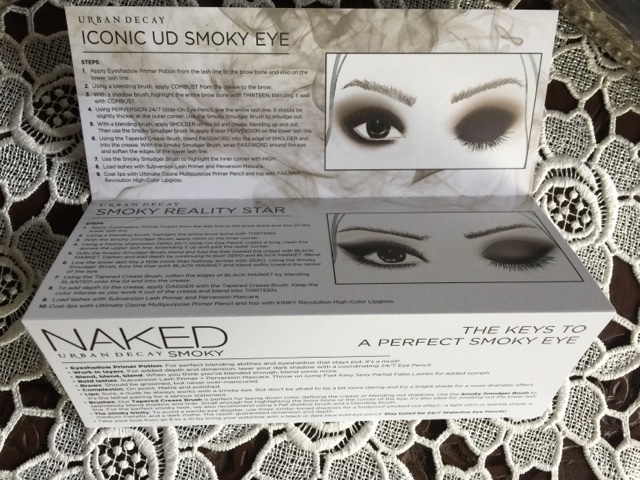 Packaging: The UD Naked Smoky is encased in the best packaging of any of the Naked palettes so far. Strong, study, sleek packaging that closes shut with a metallic enclosure. The dual ended brush has both a fluffy end for blending and a shorter rounder end for inner corners, outer Vs and right under the lower lash-line. The mirror on the other side is huge and spans the length of the palette. I love the design at front, it's a beautiful simple smokey design that compliments the theme of the palette perfectly. Well done, UD, packaging is 10/10. 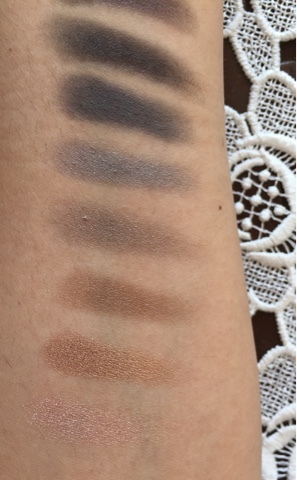 Pigmentation: As always, the pigmentation is on fleek with yet another UD palette. The shimmers and satins are vivid and blendable. The mattes are also exceptionally vivid (including Thirteen - the matte ecru shade). I haven't had any problems with fallout, although the pigmentation is strong so a little will go a long way. Price Point: At 54$, and 12 shadows in the palette, its 6$ a Shadow. Granted, they're not full size UD shadows, but still a great combination of shadows to take on the go or just to have all right in front of you for look inspiration. Overall, it's still pricey though, but its a high end brand and that won't be changing. 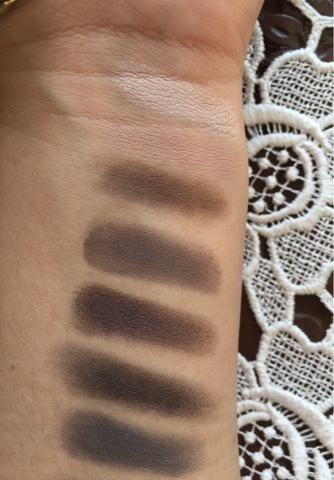 Functionality: With this palette you get a great range of deep dark shades you can play with and create a smokey eye: greys, blue, silvers, browns and a bit of gold. They're arranged in a way that makes sense. We have both satins/shimmers and mattes, the darkest of both arranged at the middle and going from dark to light towards the edge of the palette. Mattes on the right and Satins/Shimmers at the left. I've worn 3-4 colours on my lid and just 1-2 as well. All colours were blendable with minimal fallout. The darkest colours, as I've mentioned before, are very pigmented and harder to apply if you're heavy handed. However, if used with a lighter hand, they're easier to build and blend. I've worn it for the whole day and it stayed on, with minimal fading. I will say that you should be using a primer or it does tend to crease with sweaty or oily lids. Accessibility: Easy Peasy! 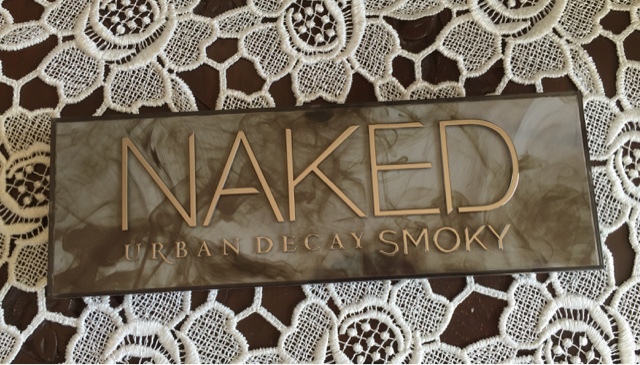 Urban Decay's Naked Smokey is available at Ulta and Sephora stores, plus online at Urban Decay, Ulta and Sephora. Earlier in the post, I mentioned that this palette was not for everyone, and that's still true. Would I recommend it for purchase? I would. To everyone? No. Why? Since it's a smokey palette, and if this were to be your first palette or if you wanted an everyday palette would not be for you. It's definitely for a beauty lover who either wants to add this versatile palette to her (or his!) collection OR would like to play around with creating a smokey eye. If you're just getting in shadow looks and are starting out with every day looks, I'd suggest the first or second Nakeds. But, if you're a lover of the smokey in a big way (like me!) and do it often, I'd go for the Naked Smoky. It's an amazing and well thought-out palette for the smokey lover. What do you think of this palette? Have you tried it and would you purchase it?